Turkey: Is the AKP's "Spell" Reversing? On March 23, Ankara Mayor Melih Gokcek called for the dismissal of Deputy Prime Minister Bulent Arinc, tweeting, "We don't want you." When Turkey's Islamists came together under the roof of the Justice and Development Party (AKP) in 2001 and reflagged themselves as conservative democrats, they did not know they would have to get quickly organized for early parliamentary elections in slightly over a year. They did so, and successfully. But they probably could not imagine that in 14 years time they would have won seven elections -- three parliamentary, three local and one presidential -- in addition to two referendum victories, and are heading for a 10th win on June 7, in less than three months' time. At the moment, the AKP remains challenged only by a relatively weak opposition, made up from social democrats, nationalists and Kurds. A recent opinion poll, released in March by Gezici Research Company, put AKP's popularity at (a lowest among all polls so far) 39.3%, with the social democrats at 29.6%, nationalists at 17.7% and Kurds at 11%. These are not comforting numbers for the AKP, but they do not signal disaster. It looks, however, as if the AKP's biggest enemy is the AKP. It looks as if the AKP's biggest enemy is the AKP. After the party's undisputed leader, Recep Tayyip Erdogan, entrusted his seat as prime minister to [then foreign minister] Ahmet Davutoglu, and ascended to the seat of the presidency last summer, things looked smooth and the party bigwigs looked as united as before. Then a silent power struggle took off between the president's men and the prime minister's. Insiders speculated about silent cracks. But the cracks would not become public until the last week of March. On March 20, President Recep Tayyip Erdogan abruptly said that he did not approve the formation of a monitoring committee -- set up by Prime Minister Ahmet Davutoglu and the pro-Kurdish Peoples' Democratic Party (HDP) -- as part of what is publicly known as the "Kurdish peace process," an effort Erdogan himself launched in 2012 to end the three-decade armed conflict with the country's restive Kurds. It looked like a tiny disagreement. It was not. In response to the president, his long-time political ally and party heavyweight, Deputy Prime Minister Bulent Arinc, said that Erdogan's words were "emotional and personal." He added that "the responsibility belongs to the government and we can regard his statements as his personal views." That was a near bombshell in Ankara: This was a first direct criticism and challenge to Erdogan, it came from one of Erdogan's top allies and it signaled a rift between Erdogan and Davutoglu. 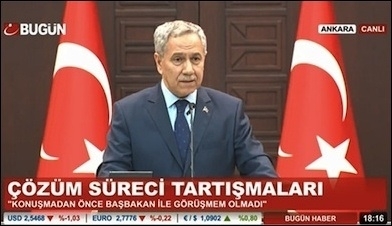 On March 22, Arinc said: "We love our president, we know his power and are also aware of the services he will give, but please do not forget that there is a government in this country." In this remark, the "we-love-our-president" part was cosmetic. The "there-is-a-government-in-this-country" part was a serious challenge to Erdogan. And all hell broke loose. On March 23, the AKP's "civil war" would become even more public. Turkey's Deputy Prime Minister Bulent Arinc addresses a press conference, following the demand of Ankara's mayor that Arinc resign. 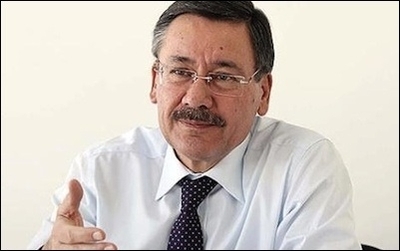 Ankara's AKP Mayor, Melih Gokcek, a fierce ally of Erdogan, called on Davutoglu to dismiss Arinc. "We don't want you," Gokcek wrote in his Twitter account. Arinc's reply only raised the stakes in AKP's civil war: A call for his resignation was beyond Gokcek's authority, and Gokcek said what he did in order to guarantee his son's parliamentary candidacy on the AKP ticket [by trying to look good to Erdogan, who still controls the party]. No doubt, Erdogan will intervene at some point, and both the president and the prime minister know well that such public warfare between party bigwigs ahead of critical elections will not be good for the party's popularity. Tensions may seem to have been diffused after some further bickering. But it will not mean that within the party peace will be restored and that everything will be peaches and cream. There is a war. And that war is growing less silent. A prominent Turkish columnist, known to be very close to the AKP administration, warned that the ongoing infighting could reverse the party's "spell." The AKP 'has a spell.' Masses preferred the AK Party because it was the symbol of stability. Now this spell is being reversed ... Since it was established on Aug. 14, 2001, the AK Party had never experienced the kind of infighting that it has been doing in the past three months. The AKP's spell may or may not be reversing. But it is clear that the AKP has grown too powerful in recent years, and that only it can defeat the AKP.